Clipsal C-Bus Pink Cat 5E UTP Cable with Mains Rated Sheath, 305 metres. Clipsal C-Bus cable is specially designed for professional C-Bus installations, being Cat.5e rated 4 pair Unshielded Twisted Pair (UTP) cable but with a unique pink coloured mains rated outer sheath that unlike standard Cat5E, can legally cohabitate in electrical enclosures with 240 volt wiring. 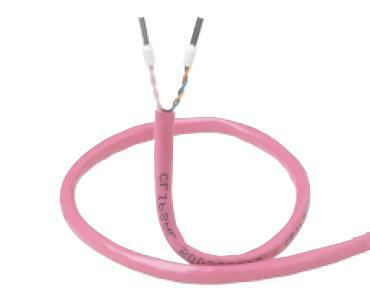 'C-Bus Pink' is available in either a Solid Core conductor (5005C305B) great for fixed installations or a Stranded Core conductor (5005C305BST) version good for flyleads or other flexible situations like office ductwork incorporated systems or false ceilings. In a standard C-Bus installation, a maximum of 3 boxes (or ~1000 metres) of cable is permitted on a single C-Bus network. 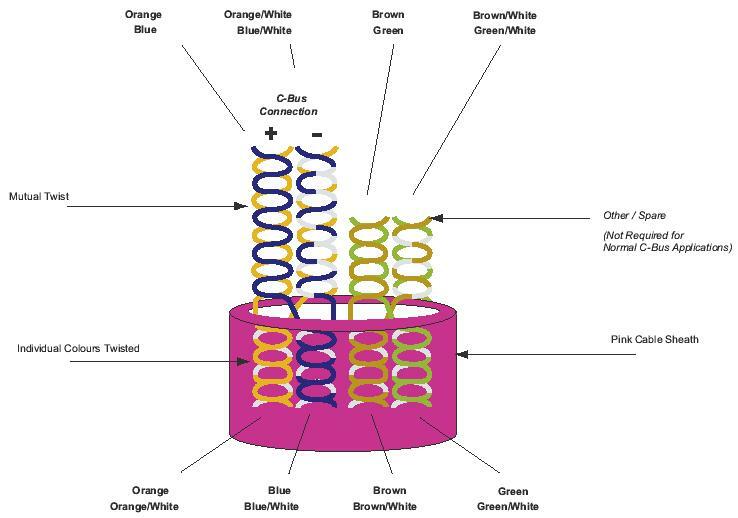 Two pairs are normally used for the C-Bus connection with C-Bus positive cable using blue + orange conductor and the C-Bus negative cable using blue/white + orange/white conductors. One box covers the installation in most suburban homes. For best noise immunity, the C-Bus cable should be segregated from the mains cable in C-Bus installations. Failure to comply with all the appropriate C-Bus wiring rules may void or reduce the warranty on a C-Bus installation.